The city of Madison Indiana sewer department treats Jefferson County waste water so when the Well’s Drive lift station’s pumps and equipment were at risk from rubber roof leaks, Exterior Pro Roofing was called and asked to propose a possible solution that would eliminate the leaks and fit within the cities budget. The single story brick building that houses the pumps, which move waste water to the treatment plant, had a EPDM rubber roof. 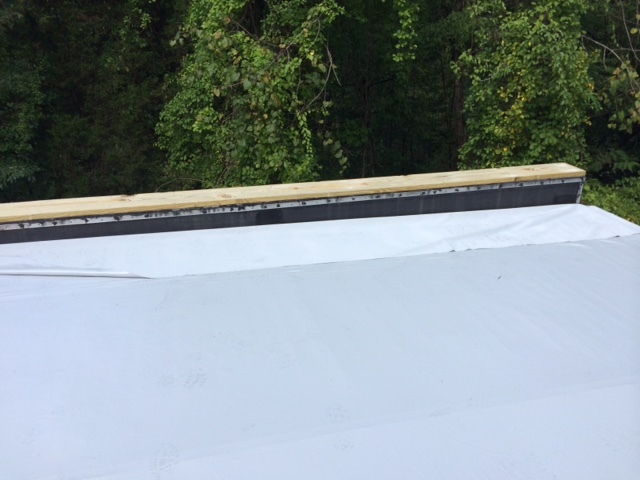 The roof has been installed properly and lasted many years however over time the termination along the parapet walls and seam below had begun to leak. Water would then travel along the metal deck and drip on electrical panels and pump controls. The flat roof leaks had become so frustrating that the sewage department heads were considering having wood trusses installed over the building and installing a metal roof altering the structure away from a flat roof. However, this solution was roughly 35% more than having Exterior Pro Roofing lay a new PVC membrane directly over the existing rubber roof. Decisions were made and Exterior Pro Inc was awarded the business. We ordered the material and scheduled the job. 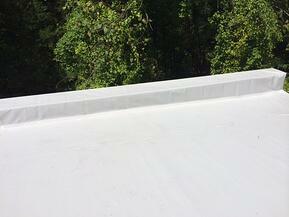 Even though the existing rubber roof had leaked the existing insulation had not yet become saturated with moisture. Because of this the roof was able to be recovered. Only this time around we were not just going to cover the flat roof section of the building, we also encapsulated the parapet wall with membrane. 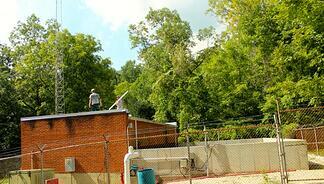 Taking the membrane up and over masonry walls is a great flat roofing tactic. It eliminates any chance that water can penetrate masonry cap and make it into the building and it also extends the warranty to now cover the walls. On this particular building we installed wood nailers on the wall cap, took the membrane up and over and then finished off the edge with a 5” metal trim. This project took a two man crew two days to complete. We were able to eliminate the leaks and threat to the pumps and equipment and stay well within the cities operation budget. This roof received a 15 year warranty.